My Thai Cooking welcomes everybody from tourists to local residents. We offer a large menu of Thai courses, from Royal Thai cuisine to snack and street food favorites. Easy access via Bangkok’s Sky-train system with complementary pick-up at Bearing BTS station. Cooking and food preparation is done in our relaxed and friendly air-conditioned home style kitchen using only fresh and natural ingredients. We offer the choice of shared cooking classes, express cooking classes, private cooking classes and vegetarian cooking classes. Booking is easy, you can simply use our online booking system or contact us via email, phone, Messenger or WhatsApp. Upon receiving your booking we will contact you to confirm and setup class schedule and selection of dishes according to your preferences. My Thai Cooking’s shared cooking classes are a great way to socialize, experience Thai market culture and authentic Thai food. ✔ Pick-up point: Bearing BTS Skytrain station. View Bangkok BTS Skytrain routes and stops here ». ✔ Menu: This class have 4 Thai dishes, where 3 are from our daily changing menu sets, and 1 dish which each student can choose freely from our Thai dishes menu. ✔ Itinerary: The class starts with a visit to a local fresh food market, then on to hands-on cooking of 4 authentic Thai dishes and last but not least eating the delicious Thai food made during the class. ✔ Times: We offer the choice of morning, afternoon or evening classes. ✔ Language: The class will be conducted in English. Included in the price: Pickup and return to Bearing BTS station, all ingredients, coffee/tea/refreshments, Wi-Fi internet access and copies of the course cooking recipes. 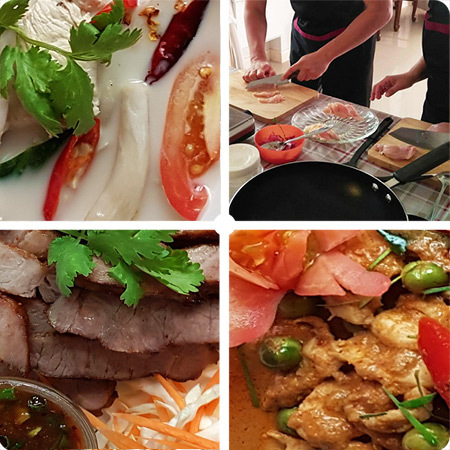 My Thai Cooking’s express cooking classes is the ideal way to get an introduction to Thai cooking when you have limited time or just want to get straight to the cooking part. ✔ Itinerary: The class starts with hands-on cooking of 4 authentic Thai dishes followed by dining on the delicious Thai food you have just made. My Thai Cooking’s private cooking classes with its flexible scheduling is the perfect way to experience Thai cuisine and culture together with friends and family. ✔ Pick-up point: Bearing BTS Skytrain station. Other places can be arranged by special request. View Bangkok BTS Skytrain routes and stops here ». ✔ Menu: You can freely choose 4 dishes from among our large selection of delicious Thai dishes. You can also requests all vegetarian dishes and/or replacement ingredients. ✔ Itinerary: You can choose to start off with shopping for ingredients or just skip straight to learning to cook the selected Thai dishes. ✔ Language: You can choose if you prefer the lessons to be in English or Thai.